WILLIS, VA – April 5, 2017 Travianna Records is pleased to announce the signing of Tara Dente. Tara is a talented folk/alternative guitarist, singer and songwriter from Asbury Park, New Jersey and is an integral part of the area’s historic and creative re-awakening. Tara’s second album, The Gleaner, will be released on Travianna Records on June 2, 2017. Tara’s musical background began with piano composition and later evolved to songwriting for guitar and vocals. Her musical influences, among others, are Nick Drake, The Shins, Enya, Johnny Cash, and Brooke Fraser – all of whom helped to create Tara’s own unique style. Because of her talents, Tara was nominated for the Asbury Music Award in 2014 and 2016 for Top Female Acoustic Act. Please join Tara for a special FREE pre-release party on May13th at Langosta Lounge, located at New Jersey’s Asbury Park boardwalk at 9:30pm. She will be joined by special guests, Rachel Ana Dobken, Pamela Flores, and Cranston Dean. 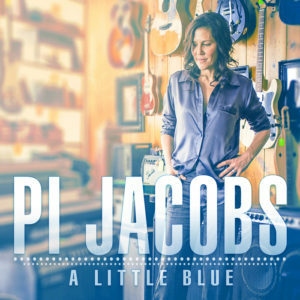 Los Angeles, CA – Travianna Records is pleased to release the first single from Pi Jacobs’ 7th album, A Little Blue. Pi (pronounced like the mathematical constant) penned the entire project including the single “Good Things.” Recorded at the revered Mountain Fever Studios in Willis, VA, “Good Things” tells how life can bring good or bad experiences – it’s all how you look at it. Pi is no stranger to the L.A. music scene and has many fans around the world. Known for her Americana Roots/Rock style, Pi takes a little jaunt from her characteristic work with her new album and brings listeners an all acoustic project produced by the accomplished Aaron Ramsey, a respected bluegrass and roots artist and producer. What resulted from their brilliant collaboration is a vulnerable and sultry project that quickly becomes a vice for the listener. Fans can get their first glimpse into Pi’s new project by checking out her new video for “Good Things” that premiers today. Download “Good Things” and pre-order A Little Blue on iTunes now to receive Pi’s song “Beautiful Morning” instantly for FREE! A Little Blue will be available on iTunes, Amazon and other digital sources on March 31st. DJ’s can download “Good Things” on AirPlay Direct or request a direct digital download by emailing radio@traviannarecords.com. For more about Pi Jacobs visit www.pijacobs.com.